Is An MBA Programme Worth It? With 86% of surveyed businesses planning to hire MBA graduates in 2017, up from 79% in 2016, the demand for professionals with MBA-level business acumen is increasing year-on-year. But those MBA skills aren’t available to just anyone. They come at a steep price, with high levels of preparation required for MBA studies and increasingly low acceptance rates. How much do MBA programmes cost? 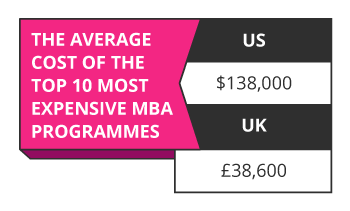 The average cost of the top 10 most expensive MBA programmes in the US and UK are roughly $138,000 and £38,600 respectively, and that only covers the price of tuition. When considering the true cost of studying an MBA, including tuition, accommodation, fees, and lost income from full-time studies, the cost of a Stanford University MBA is estimated at just over $400,000. With such high costs associated with studying an MBA, many professionals simply cannot commit the time and resources to learning full-time. Alternative MBA-style courses allow business-minded individuals to acquire MBA-level skills and business acumen without the colossal expenses in both time and money. How many people get accepted to MBA programmes? The number of available MBA programme seats in the top 10 business schools in the US was only 7,934 at the beginning of 2017, with the number of applications at a staggering 54,694. That’s an acceptance rate of only 14.5% – more than a full percentage lower than last year’s rate. Such low acceptance rates mean prospective MBA students need to be among the top echelons of their peers, further reducing the accessibility of full-time MBA programmes to the majority. Preparatory MBA courses allow you to pursue the skills and knowledge you’ll need to increase your eligibility for a full-time MBA programme. Used by most business schools as a screening test, the GMAT helps you stand out during the admissions process. When you perform well on the exam, you demonstrate your commitment, motivation, and ability to succeed in business school. As a prospective MBA student, you’ll want to aim for 20 points above the average GMAT score of your business school of choice – meaning, you’ll need all the help you can get. While the GMAT can help you get into your dream business school’s MBA programme, it can also prevent you from qualifying for the course should you perform poorly. With these kinds of barriers to overcome, it makes sense to do all you can to prepare for a full-time MBA, or even find an alternative course of studies that teaches you the essential MBA skills without the time or capital commitment. Preparatory MBA courses, such as the MBA Essentials online short course from the University of Stellenbosch Business School Executive Development, allow you to gain credible MBA skills to boost your application to a full-time MBA. Furthermore, you’ll gain insight into the level of commitment required to complete the illustrious master’s programme and an understanding of the level of content therein. The USB-ED MBA Essentials online short course prepares you for the technical coursework by helping you learn about three key pillars of business covered in an MBA programme: economics, quantitative methods and managerial accounting. You’ll use your own business as a case study during the course, allowing you to walk away from the course with a better understanding of business, and improved managerial decision-making. MBA-based courses, such as the MBA Essentials online certificate course from the London School of Economics and Political Science, are designed to give you a well-rounded knowledge of the topics covered in a full-time MBA, covering the hard and soft skills required to excel in the contemporary business environment. This knowledge can be used to either prepare yourself for MBA studies or to augment your business acumen with MBA-based skills – without having to commit the time or money to studying a committed MBA programme. 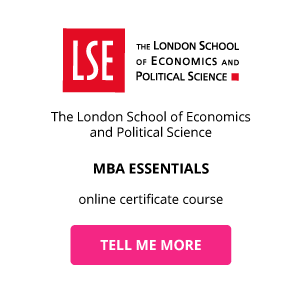 On the LSE MBA Essentials online certificate course, you’ll learn about three core pillars of business strategy – the strategic environment, the financial toolkit and the human element. During the course, you’ll not only gain formal expertise in strategy and finance, but you’ll also learn how to form business partnerships and influence people, allowing you to build your management competencies as you use your MBA-level skills to move your career forward. With massive barriers to entry into full-time MBA programmes at business schools, the need for alternative, accessible MBA programmes is on the rise. The growing trend of education moving into the online space is allowing individuals to grow their professional skill sets in their own time, from anywhere in the world, at a fraction of the cost and time required. As the demand for MBA skills increases and online learning reduces the barriers to entry, MBA-level expertise will become accessible to many more business-minded professionals from all over the world – making full-time MBA programmes less of a must-have than many people think. Ready to explore alternative MBA-based online short courses? Download the course prospectuses to learn more about these MBA programmes from world-leading business schools.